How would surfactants with a dipole moment in contact with water be characterised? Would this mean that most likely the ionic head of a surfactant interacts with either the partially-positive hydrogen or partially-negative oxygen moiety of a water molecule? If so, what would be the proper way to characterise this phenomenon? In what phase of the monomolecular layer are the sizes of surfactants determined? I am puzzled by this question, as I do not understand what exactly is meant by phase. I have spent relentless time trying to search for monomolecular layers and their phases but I have come out empty-handed. I see that phase can refer to distinct boundaries of physical states, such as those between gasses and liquids, but I do not know how this could be used to find the size of molecules. I know that in order to find the area that each surfactant molecule covers at an interface the Gibbs Adsorption Equation is utilised, however it uses concentration of surfactant molecules plotted against surface tension. I would be much obliged if anyone could provide assistance to aid me in understanding this subject of surface chemistry better. Surfactants (aka tensioactive compound) have a dipolar moment at the air-water interface but that is not enough to characterize their behavior. There is a cohesive force between their lipophilic tails (due to Van der Walls force) and there is also a cohesive force between their polar head but only because water of metal ions can make a bridge between identically charged moieties. I will address only your main question which seems to be "how to know the size of molecules in a monolayer"? Well, a surfactant floats at the surface of water. So you can make an apparatus filled with water and with a movable barrier which will move across the surface to slowly reduce the overall surface available for a tensioactive compound. We also know how to measure variations in the "tensioactive power" (whatever its name is) which depends on the number of molecules at the surface. Using such a device, we can create a monolayer of a lipophilic compound, reduce the whole area (which we call a "compression") and detect the resulting effect (which correlates to the number of molecules at the surface). Whenever the available surface becomes too small for all the molecules to be nicely arranged at the surface (i.e. the "collapse"). Regarding question (2), the wikipedia page describing Langmuir-Blodgett films may help. When a condensed phase is formed, the surface pressure-area curve goes through a discontinuity. 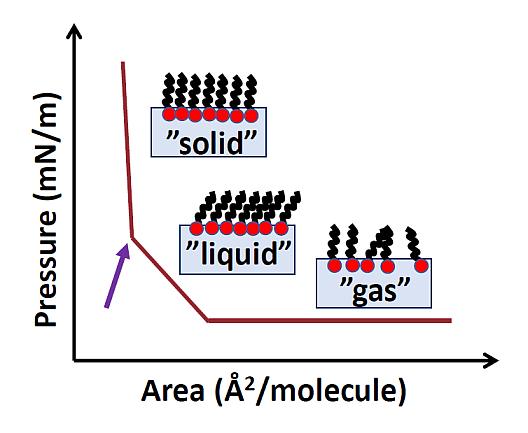 At the point where the liquid expanded phase transitions into the condensed solid phase (indicated by the arrow), the area divided by the amount of surfactant provides a measure of the (molar) headgroup area. Not the answer you're looking for? Browse other questions tagged surface-chemistry surfactants or ask your own question.